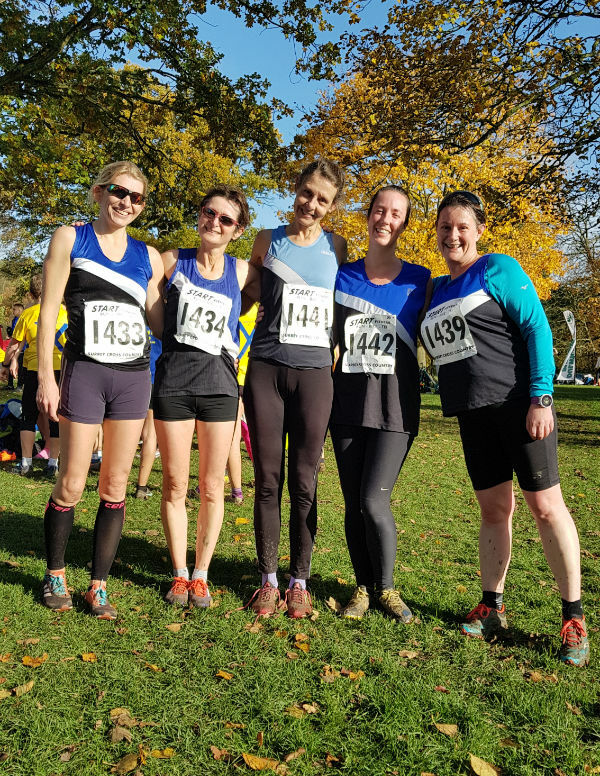 The second league match took place at Nonsuch Park, Ewell on 10th November 2018. After a wet start to the day which muddied the course, bright sunny conditions emerged and our ladies enjoyed the earlier start for Division 2 race. The course, though a bit soggy and measuring a little longer than last season at 3.95 miles, remained mostly flat and fast. Once again only a small team made it to the start line, meaning that it was vital for all 5 team members to finish the race and score as few points as possible in another record field for the league. Our veteran team members gave solid performances, with Liz Richardson leading the team home in 77th place in a time of 30:05. Nicky Atkins, slightly under the weather with a cold, battled well to 105th place (31:19), with Nicki Murphy chasing hard with a time of 32 minutes 11 for 129th place. Jo Murphy, continued her comeback, finishing in 34:33 (176th place) and Caroline Jeffcote, in her first race of the winter season, completed the team score in 270th place (41:31). Though the team lacks an individual scorer making an impact at the head of the field, the finish positions are representative of a very high quality and strong Division 2 field, that is now larger than the previously combined field for both divisions of the league. The second match of the season attracted a record 543 senior athletes, with 298 competing in the Division 2 race. As one of the smallest teams in the league, Kingston and Poly ladies did well to finish in 20th place out of 24 teams.